1) I am not dead. 2) I have not been abducted by aliens. 3) I have not abandoned this blog. Base cards: The base set is comprised of 120 cards. Cards 1-90 make up the short set while cards 91-120 are shortprinted prospects which are seeded in every other pack on average. The base cards have the same type of clear plastic surface used in the previous year’s E-X. In total, I received 44 short set cards and 9 shortprints, with no duplicates. The shortprinted cards were nothing special, with the only notable players being Adrian Beltre and Trot Nixon. E-XQuisite (1:18 packs): The most common insert found in this product is called E-Xquisite. Falling at a rate of 1 per box, these cards feature a black border and a smoky background. I pulled a Jeremy Giambi, which normally wouldn’t elicit any excitement, but when we flip it over………………PSEUDO-GANGSTER BACK!!! Are you reading this, Mr. Harris? What WASN’T Pulled: Yeah, seriously, I’m at this part of the review already. Well, you can’t talk about old E-X without mentioning the Essential Credential Now and Future parallels. In 1999, the Now and Future parallels featured silver and gold backgrounds respectively. The print runs for the “Now” cards were equal to the card’s number in the set. The print runs for the “Future” cards were based on the card’s number, subtracted from 121 (#1 would be limited to 120, #2 to 119, and so on). Favorites for Fenway ’99 – a star-studded 20-card set with inserts that can be found in every other box. Speaking of the ’99 ASG, who could ever forget those pre-game festivities? Milestones of the Century is a 10-card set commemorating milestones reached by the likes of players like Mark McGwire, Sammy Sosa, Barry Bonds, Alex Rodriguez, and even the New York Yankees team. The print runs vary by milestone and range between 17 and 400. For example: McGwire (70 – ’98 HR total), Bonds (400 – 400 career home runs and stolen bases), Yankees (114 – ’98 regular season wins). 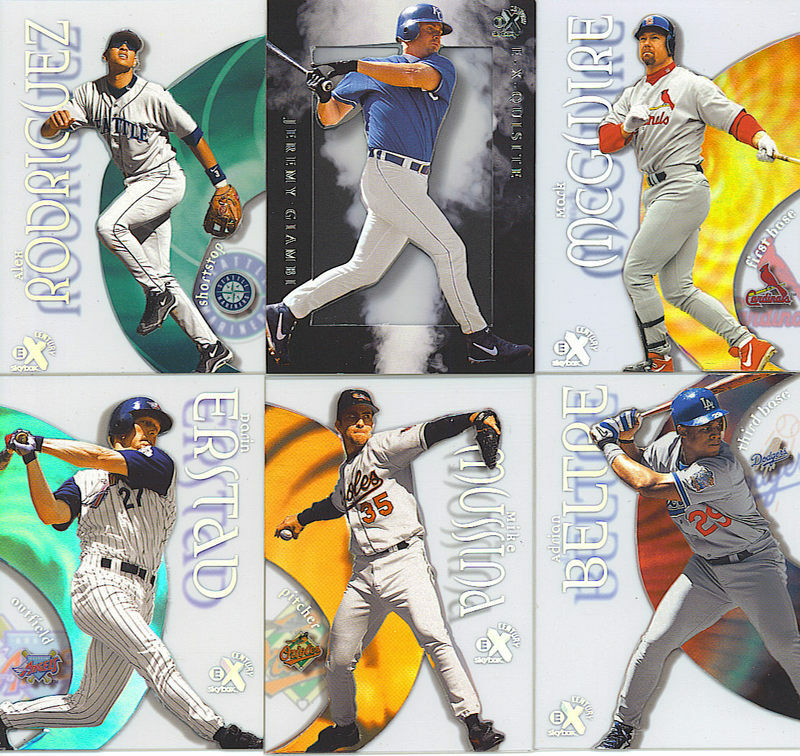 This was also the first time E-X offered game-used cards, shoe pieces to be exact, in the Authen-Kicks set. There were 9 players in this set and the print runs ranged from 160-205. Some players include Todd Helton, Troy Glaus, Scott Rolen, and J.D. Drew. Autographed cards of J.D. Drew were also randomly inserted in this set. Final Thoughts: You aren’t guaranteed a whole lot when you open a box of this product and I didn’t get much. I pulled one insert in this box and it was of Jeremy Giambi. That should tell you something. Despite receiving a dud of a box, I still wasn’t disappointed. Being an old Fleer fanatic (as well as a glutton for punishment), I like this set now as much as I did back then and will probably bust another box in the future with the intentions of putting the set to rest. If you liked flashy cards from the 90’s, this product is for you. You just might want to break more than 1 box! Base set: The base cards are not as colorful (and seizure-inducing) as in years past, and that’s a good thing. The top of each card features a header comprised of four small baseball-themed images. Below this header is a single-colored background. In this box, I was able to pull 245 out of 300 base cards, with 31 duplicates. Unleashed (1:6): The most common insert found in this product is called Unleashed. All you need to know about these cards is that they look like Wheaties boxes. Seriously. The players’ height and weight are listed at the bottom of the front (just like a cereal box) with a facsimile signature sitting to the left. Most of the 15 players in this set were in their second or third year of ML experience at the time of production. My players were Adrian Beltre, Kerry Wood, Troy Glaus, Carlos Beltran, Orlando Hernandez, and Todd Helton. Also, in small print under the card’s title, it says “all natural.” That’s pretty ironic in Troy Glaus’ case. http://www.batterz.com (1:18): Batterz.com is a 10-card insert set which features the players in a pretend web browser. The buttons at the top of the “browser” say hit, run, grand slam, RBI, steal, and home run. Oh, the cheesiness of it all. I pulled a Bernie Williams and a Mark McGwire. 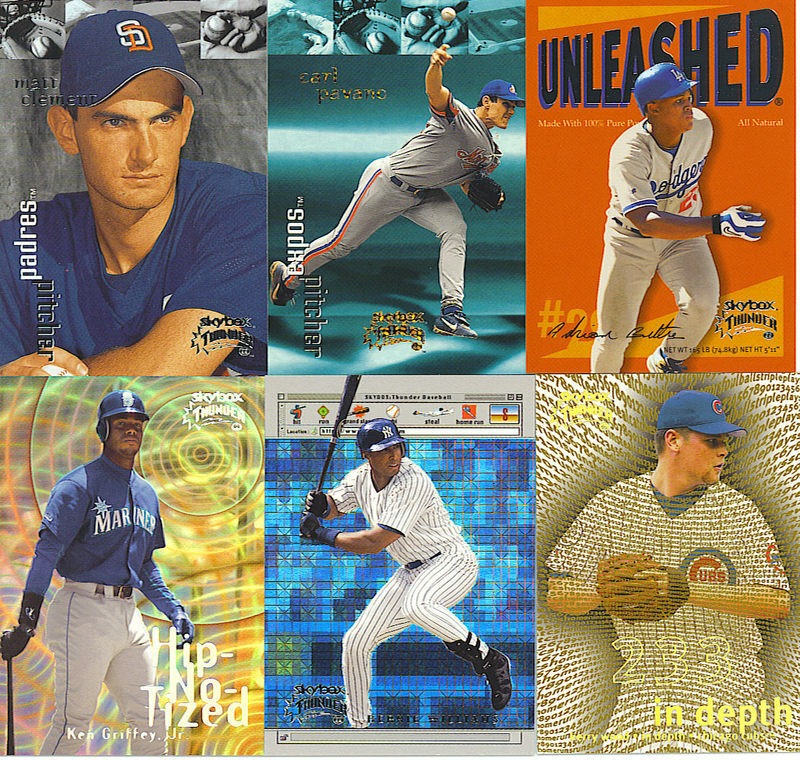 In Depth (1:24): In Depth is an insert set that breaks down the 1998 stats of 10 players, with one selected stat being highlighted on the front of the card. On the back, the stats break down as follows: Pre-ASG, Post-ASG, Home, Away, Day, and Night. I pulled a Kerry Wood and a Barry Bonds. Wood’s featured stat is the 233 strikeouts he recorded during his rookie season. For Bonds, it’s the .325 average he recorded at home (I…think). Hip-No-Tized (1:36): Circles, circles everywhere. It’s a pretty standard (for the time) rainbow foil insert. Personally, I think it looks like something that should’ve been put in Upper Deck MVP or something, but that’s just me. Anyway, these fall one per box and I pulled a Griffey. Super Rave (limited to 25): Every Circa/Circa Thunder set ever made has come with a parallel called Rave. At the time, these were high-dollar parallels numbered to 150 (these were around before the Flair Showcase Legacy cards!). In 1998, when the product became “Thunder”, a second parallel was added. It was an even rarer form of Rave entitled Super Rave. While its sister parallel was numbered to 150, Super Rave was numbered to only 25. Super Rave cards were randomly inserted into 1999 Skybox Thunder as well and I was fortunate enough to find one in this box of Carl Pavano. The main difference between these cards and the base is the bronze glittery text in the player’s name as well as the product’s name. Pack odds for Rave and Super Rave cards were never stated for this product. What WASN’T Pulled: Thankfully, this section will be short. Most breaks of this product I can recall contained one of either the Rave or Super Rave parallels. Seeing how I pulled the latter, I did not receive a Rave card numbered to 150. For anyone wondering what those look like, I give you this. Another insert missing was Turbo Charged, found 1 in every 72 packs. They look like a ripoff of James Bond’s entrance if you ask me, ha! There was one other insert I did not pull, the very rare Dial 1. These were seeded only 1 in 300 packs on average and had the image of a portable phone as a background. Final Thoughts: This was a pretty decent break. The inserts were plentiful and some were fun to laugh at quite honestly. Pulling a parallel /25 was nice too, even if the guy’s an injury-prone hack who hasn’t done anything in 4 years. Still, for just $20, this box will give you some bang for the buck, which is more than I can say about most blasters out there, well except for Topps Chrome (for all the Joe Collectors! LOL). Carlos Beltran Unleashed: “You’re the man, Beltran…’cause you’re goin’ crazy in K.C. And we’re convinced you’re gonne be a superstar, Carlos, ’cause your game is straight jiggy. Ken Griffey, Jr. Hipnotized: “You’re so fine, you’re a dime. That’s right, Griff, you’re a perfect “10.” But if we had a nickel for every time you captivated fans with your skillz, we’d be rich. Livin’ so large, you’re bigger than the Space Needle…and your star is still risin’. Orlando Hernandez Unleashed: “We got a phat nickname for ya, Orlando. We’re gonna call you the Cuban Commando…’cause you came stormin’ into the Majors and just started takin’ batters out. On that note, I don’t think I can take more of this!! Hope you enjoyed those! Base cards: The base set is comprised of 300 cards, while the master set is comprised of 350 cards. I’ll explain this in a minute. The base cards are very colorful. The front of every card features the player’s initials in cursive letters, directly above the name/team/position information. All of these feature a gold, shiny font. The players also have a blend of colors directly around them, somewhat like “motion lines.” That sounds a little strange, but if you look at the Nomar Garciaparra base card above, you’ll understand. With that said, the first 222 cards are strictly veterans. Cards 223-272 feature 50 different players designated as “rookies.” This is where that master set thing comes into play. The 50 “rookie” cards are not shortprinted themselves, but they DO have a shortprinted variation that are seeded 1 in every 8 packs. How can you tell which is which? The SP’s feature full body shots of the player while the basic cards feature close-up shots. Thanks to reader Enomes for correcting me. Cards 273-297 make up a subset called Spring Fling. These cards, both front AND back, are designed to look like a postcard. There’s even a mock postmark on the back! Kinda cheesy but kinda cool…..I guess. Finally, 3 checklists at the end round up the base set. In this box, I received 181 of 300 cards with 2 duplicates and 3 shortprinted rookies. When the only one of these rookies you can recognize is Joe McEwing, that’s never a good sign. 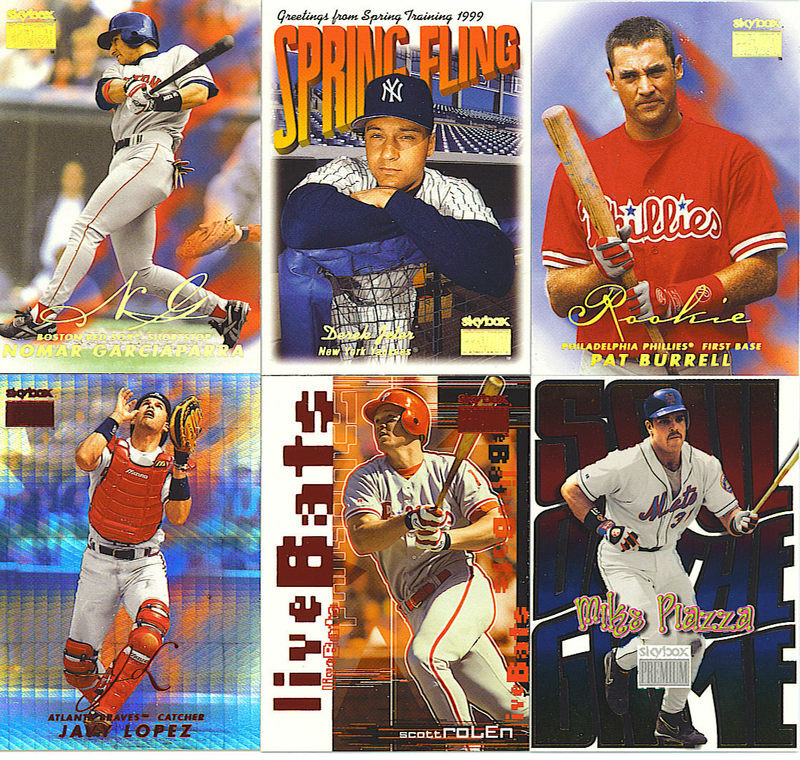 Live Bats: These card were seeded 1 in every 7 packs. I ended up with Frank Thomas, Jeff Bagwell, and Scott Rolen. I’m not sure how to begin describing these so I’ll let the scan do the talking. They’re not particularly bad-looking inserts, but somehow, I just don’t feel them. Soul of the Game: Looking like something straight out of the early 1970’s, these cards can be found 1 in every 14 packs. I pulled a Mike Piazza here. Boy, he sure does show up in my breaks a lot! I don’t want to use the word “groovy” to describe this insert set, but it just looks……um……..nevermind. Star Rubies: This might’ve been the hit of my box here, sadly. This parallel features an awesome finish to the card with red font all over and is limited to just 50. I should note that the SP rookies also have this parallel, only numbered to just 15. It was pretty cool finding one of these, even if it was just Javy Lopez. 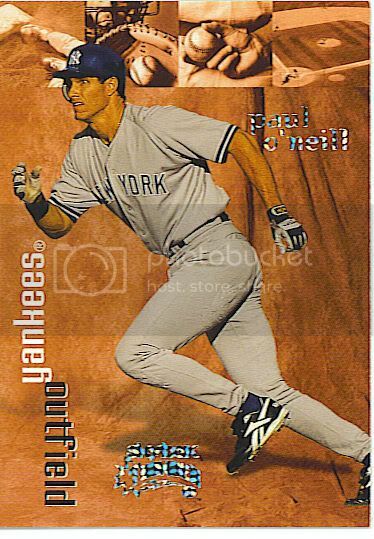 On a side note, if I ended up pulling one of these of Paul O’Neill, this would’ve instantly qualified for one of my favorite breaks ever. 😀 Remember, pulling a card /50 was pretty rare at the time, so this might’ve been a 1:2 box pull (or more perhaps?). So concludes another old box break of mine. Like I said earlier, I don’t dislike this product. I just felt that this box in particular just didn’t offer much and have that one standout pull, but I guess all products have those. There were several other inserts I didn’t receive any of: Diamond Debuts (1:49 packs) Show Business (1:70 packs), Intimidation Nation (numbered to 99) and Autographics (1:68 packs). I thought maybe I would’ve hit at least one of those with a 24-pack box, but it was not to be. If you think about opening a box of this product, I hope this review doesn’t discourage you. The set and inserts are pretty nice overall and there’s always a chance at a big pull. Autographs aren’t that unattainable and have a decent checklist that features the likes of A-Rod, Gwynn, Glavine, Schilling, Rolen, Burrell, Alomar, and many others. I just hope that if you do decide to try a box of 1999 Skybox Premium in the future, that you’ll fare better than I did.